Greg Gilbert played for the Crimson Tide of Alabama from 1985-1988 posting 256 tackles. In his banner Sophomore season he recorded 103 tackles, (5 TFL), recovered 2 fumbles, and intercepted a pass. While he posted 90 tackles in his Junior season (second on the team,) an injury riddled Senior season sent his draft stock plummeting. Gilbert was drafted by the Chicago Bears in the 6th round of the 1989 NFL draft. He’d then spend the 1990 season on the roster of the Indianapolis Colts after some training camp action with the Raiders, a team that he returned to in 1991 after a training camp stop with the Eagles. 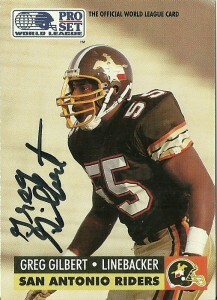 In 1991, the San Antonio Riders, (coached by Alabama alum Mike Riley,) selected Greg Gilbert with the second overall pick of the league’s initial positional draft (after Wayne Davis, Orlando). Starting for the Riders at linebacker in the team’s 3-4 alignment, Gilbert starred alongside linebackers Tim Walton and Mark Ledbetter. He’d make a pick for 15 yards that year, but by the end of the season was on the roster of the Barcelona Dragons. Greg played in 1992 with the Dragons again before the league suspended operations until 1995. Gilbert is a player that I had been trying to find for a long time. Occasionally I will do Google searches of players, and sometimes, I get a hit. I happened to get lucky and find Greg working for Central Florida University where in 2012 he was named Associate Director of Athletics Development. Since 1995 Greg has been an outstanding member of the business community, working in communications, marketing, and consulting roles. I immediately put a letter in the mail to him, and he responded in a little under a month. He enclosed a nice note to me, thanking me for the nice letter and how much it means to be remembered, and how great the league was, as they were all just kids trying to play the game they loved. Really nicely put.